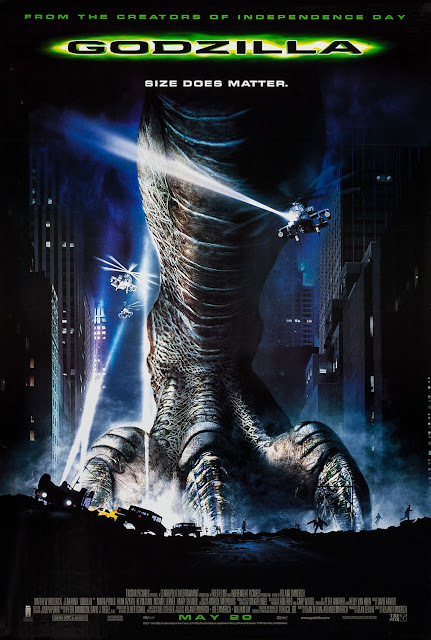 Chrichton's World: Review Godzilla (1998): Far superior to the 2014 one! Review Godzilla (1998): Far superior to the 2014 one! When it was announced many fans of the Gojira / Godzilla franchise were skeptical. And to be fair this was very justified since Hollywood very rarely adapted the source material properly or fairly. And apparently director Ronald Emmerich had disregarded all the rules given by Toho Studios regarding what they could do with Godzilla and what not. Emmerich even stated he didn't like the original Godzilla films. Such blasphemy! Despite all this I can say that while Ronald Emmerich's Godzilla seems more like a bigger and more fierce T Rex on an emotional level it resonates in the same way as the original films do. Godzilla is either seen as villain or hero in his films but in this adaptation he is just an animal doing what Mother nature dictated. Later in the plot it's very clear what his goals are and instead of the humans looking for more constructive and civilized ways to deal with it they opt for the usual and ignorant one. MDK. Murder Death Kill. Godzilla is a monster movie for sure but Godzilla isn't the monster. The humans are. We are only rooting for the humans because some of the characters like Dr. Niko Tatopoulos played by Matthew Broderick and Philippe Roaché played by Jean Reno are very likable. Their actions however are highly questionable and rather despicable. Especially in case of Niko since he had a friendly interaction with Godzilla and even was spared his life. Niko never vocally expresses how he truly feels about destroying and murdering Godzilla. I think it's implied that he is against it but has made the choice for the survival of the human race. Just to be clear I personally was rooting for Godzilla. How about the destruction and action? There is more than enough however it's far less than I had remembered. Because this Godzilla isn't really angry. And that is the biggest flaw and disappointment since for me the whole appeal of Godzilla is destroying as much as possible. At one point he does get furious but then the focus still is on the people. In a special on the Blu-ray the original Godzilla is shown. It points out why Godzilla is so loved. First of all, a man in a suit wreaking havoc looks better than any CGI creature. Second there is a charm to the old Godzilla that is hard to imitate or copy. You would think that the people behind Independence Day would up the ante just a little bit more. Still this film does compensate it''s shortcomings with comedy and some nice surprises. Of course it could have been a lot better. But compared to the 2014 version this one is far superior. It is entertaining from start to finish.